This program provides undergraduate students who may be interested in the Vanderbilt Interdisciplinary Graduate Program (IGP) hands-on research experience in the laboratory of an IGP faculty preceptor. 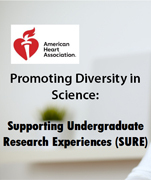 Through a partnership with the American Heart Association (AHA), mentored summer research experiences are available to students from groups underrepresented in science. Awardees will be mentored by current AHA-funded scientists who are pursuing basic or clinical research in cardiovascular disease. The Aspirnaut™ Summer Research Internship Program is a 10-week hands-on and mentored basic science research laboratory experience for undergraduate students interested in a career in biomedical research. The program features a holistic approach that augments the discovery science experience with professional skills development and guided self-discovery. The program is supported by the National Institute of Diabetes and Digestive and Kidney Diseases (NIDDK) of the National Institutes of Health and recruitment is targeted to underrepresented racial and ethnic groups, Native Americans, and those from geographically-economically-, and educationally diverse backgrounds. The Vanderbilt Research Experience for Undergraduates (REU) in Chemical Biology program is a ten week hands-on course designed to introduce chemistry, biochemistry and biology students to the research processes and the interdisciplinary nature of contemporary research. Students attend seminars given by VICB faculty working across disciplinary lines and participate in weekly discussions on topics such as research ethics and careers in chemical biology. The BP-ENDURE connects research-intensive institutions to institutions that have substantial enrollments of neuroscience majors from traditionally underrepresented groups. The current programs that interface with Vanderbilt include consortiums from: New York (Hunter College and NYU), Georgia (Agnes Scott College, Spelman College, Emory University and Georgia State University), and Texas (University of Texas Health Science Center). The program supports a range of activities to increase undergraduate student’s interest in the neurosciences, including research experiences, curriculum development, seminars and journal clubs. The Leadership Alliance Summer Research Early Identification Program (SR-IEP) offers undergraduates, interested in pursuing a Ph.D. or M.D./Ph.D., the opportunity to work for eight to ten weeks under the guidance of a faculty or research mentor at a participating Alliance Institution. The Medical Scientist Training Program (MSTP) – Summer Research Program offers undergraduate students with interests in pursuing MD/PhD dual degree training an opportunity to conduct summer research in the lab of a physician-scientist at Vanderbilt University. In addition to gaining valuable research experience, students will participate in a variety of formal and informal mentoring activities and will gain clinical shadowing experience. Undergraduate students from historically underrepresented groups will complete a mentored, summer research experience in a laboratory addressing an aspect of cardiovascular disease that is supplemented with training in critical thinking and exposure to the complexities that underlie health disparities. Students also benefit from near peer mentoring, exposure to a range of career opportunities. PAECER is funded by NHLBI. The Middle Tennessee Chapter for the Society of Neuroscience (MTNCsfn) is designed to introduce students to neuroscience research outreach training through its Summer Enrichment Research Program in Education and Neuroscience Training (SERPENT). Germs, Defenses, & Diseases (GDD) is one of two flagship undergraduate research programs supported by the Vanderbilt Institute for Infection, Immunology, & Inflammation (VI4). The Vanderbilt-Ingram Cancer Center: Discover Cancer Research Program is a mentored summer research experience funded by the National Cancer Institute (NCI) and designed to expose undergraduate students to cancer research, with particular focus on students from underrepresented racial and ethnic groups and those from economically-disadvantaged backgrounds. This program provides undergraduate students who are interested in diabetes the opportunity for a research experience in one of the many laboratories associated with the Vanderbilt Diabetes Center. The Summer Internship Program in Biomedical Informatics is designed to provide students from diverse backgrounds with a high quality Biomedical Informatics research experience; thereby encouraging students to consider pursuing PhDs and research careers in the field. The Vanderbilt Vaccine Center is committed to impacting global health through fundamental research that fosters development and testing of new vaccines for infectious diseases. Vanderbilt University School of Medicine with Meharry Medical College offers undergraduate students an NIH funded training program in vascular biology. The Short Term Training Program for Minority Students offers a laboratory experience designed to teach contemporary research techniques and enhance essential laboratory skills. Combining research activities with coursework, students gain a better grasp of research concepts and improve their critical thinking with regards to the literature and their own studies. The V-SURE program is designed to give aspiring MD and MD-PhDs students, from The University of the South: Sewanee, both clinical and basic biomedical research experiences. This is a 2-yr program allowing students the opportunity to have depth in a particular field of research and medical discipline or breadth by exploring different research and clinical experiences each summer. The Billings-Spickard and Stoney-Merrill Internships help fund this program.